Film Registration Now Open — Watershed Productions Inc.
What a great summer at film camp and what a keen group of young filmmakers we had in each of our two programs this summer. We had many returning participants, including some 4, 5 and 6 year veterans of the film camp! Even two of the instructors for the Director’s Seat program were film camp participants back in the early days. The Senior Director’s Seat celebrated their hard work and new film by screening their final projects on the BIG screen at the Civic Theatre in downtown Nelson. The younger group made over 10 films between 22 participants and held their final screening to a packed house at the 10th Street Campus. We have launched a Youtube Channel where we are in the process of uploading the films we’ve made over the past 7 years. 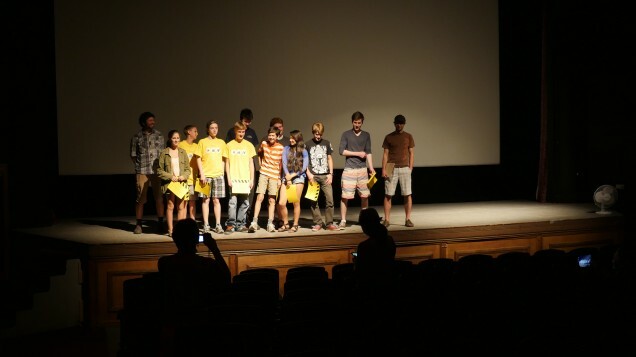 Keep checking for the films that have been made by the young filmmakers across the Kootenays and beyond. We hope to have a majority of the film uploaded by the end of the fall. Posted on April 8, 2013	in Events, Filmmaking, Resource. Bookmark the permalink.